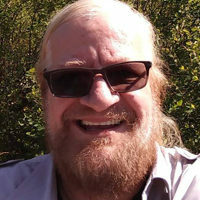 ATLANTA – Leo Gerard, president of the United Steel Workers, the union that represents some 8,000 oil refinery workers on strike across America, was not surprised when he heard about the flare-up yesterday at BP’s Whiting, Indiana plant. Some 1,100 union workers at the Whiting plant have been on strike for more than two weeks as part of the first major national strike against a big industry since the 1980’s – a strike they, and their union leaders meeting here this week say, is about safety, not wages. 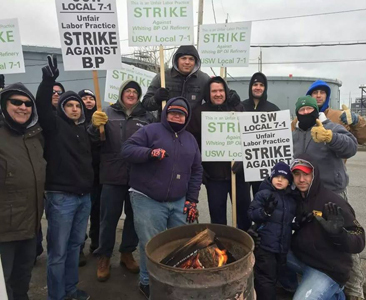 BP in Whiting, like all the oil companies being struck, is using replacement workers who the union workers on the picket line at the Indiana plant say may not be properly trained. They have told the press that alarms that are part of the regular safety procedures at the plant did not go off when the flames began to roar up through the plant’s huge smoke stacks. They are skeptical about company claims that when the flare up occurred everything went by the book. 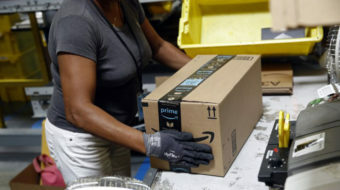 The company has issued statements that don’t mention replacement workers and simply say the plant is being run by “former” and “current” workers. Gerard answered questions during a break in the AFL-CIO executive council meeting he is attending here this week. “They use retirees as replacement workers,” Gerard said, “and I have unconfirmed reports that some of the companies have pressured some of their new and younger current workers to go in and cross the picket lines by threatening that they will not otherwise complete their probation periods.” Workers on the picket line at Texas oil refineries told the Peoples World two weeks ago that they saw people being taken out of the plant in ambulances, with the company releasing no information. “Since 2010, 27 people have been killed at these fires and explosions at these plants,” Gerard said. “I’d rather join my husband on the picket line than see him come home in a body bag,” the wife of a striking USW member in Beaumont, Texas told Gerard when he visited the picket line there. “I want my family to know I walk into a time bomb every time I go to work,” a striker told the Union leader. “It’s not just the workers that are the issue here,” Gerard said: “When the Chevron refinery explosion happened 15,000 community members in California were rushed to the emergency rooms of hospitals. Gerard said his union is prepared to counter arguments that the strike will cause prices of fuel at the pump to rise. Gerard said unions will reach out to mobilize across-the-board support for the striking refinery workers. Photo: USW 7-1 Strike Support page, Facebook.